Have you ever reached that point in the season when you think if you see another ____________ (leaf of arugula, peach, squash or fill in the blank), you’re going to scream? I get like that. And how. A few years ago it was Brussels sprouts, then butternut squash and Swiss chard. One year it was all about the beets. And now okra. I tend to be that way…fall in love with a veg and overdo it. David, on the other hand, is not obsessive-compulsive. In fact, he turns his nose up at my repetitive nature in the food world. And he’s right. Again! Dammit! Fortunately, the one thing I have not had my fill of this summer is tomatoes. I guess I have just been too busy eating melons and peaches. If you happen to be a tomato lover, the variety we have enjoyed at the Quarry Farmers & Ranchers Market is impressive, especially considering the lack of rain our farmers have struggled with again this year. Yes, we have had 26 more inches than we had last year at this time, but we desperately need some of that wet stuff that falls from the sky. Now. But back to tomatoes. The variety that our farmers have grown for us over the last few months includes heirlooms, tomatillos, green tomatoes, Rembrandt, zebra, cherry, pear, Roma, San Marzano, beefy tomatoes and even Roma-esque tomatoes and in a rainbow of colors–yellow, orange, red, green and purple and even shades in between! The ten beefy tomatoes on my kitchen windowsill were yearning for some attention and it was time to give them some love. 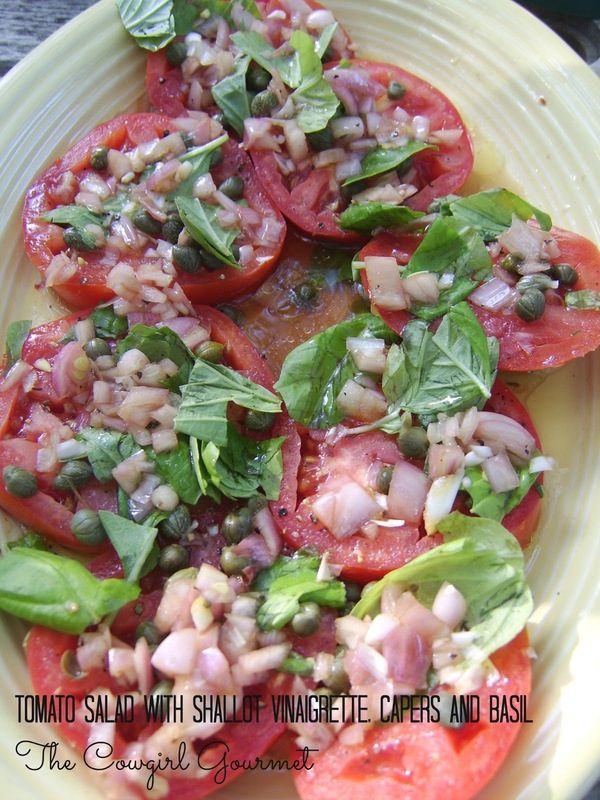 A party at our house would not be complete without at least one dish featuring something from the farmers market, so I made this tomato salad recipe that I had pulled from the May 2012 issue of Bon Appetit magazine. The thick slices of perfectly ripe and red beefy tomatoes brightened up the buffet table signaling one of the many reasons we love summer. And another example of how we love celebrating other people’s birthdays!! The trick to this simple salad is to use the freshest and best ingredients. Considering it's the peak of the tomato season, that's perfect timing. Combine shallots, vinegar, salt and sugar in a small bowl. Gradually whisk in oil to blend. Set vinaigrette aside. Arrange tomato slices on a large platter. Sprinkle capers over, season with salt and pepper. Scatter basil over the top. Whisk vinaigrette again and drizzle over salad. Previous Post: « Juicin’ It Up!